Allan Tomkins...the boss! 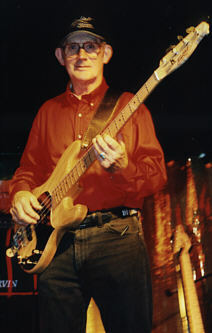 One of the most respected Country bass players in Australia. A legend of the scene, Allan has played with every major Australian Country star, including a long stint at the Texas Tavern in Kings Cross with Nev Nicholls and the Country Playboys. Allan has also played for many visting overseas performers. Below he is pictured below in Comet, Queensland with (L to R) Bobby Wright, Kitty Wells, Johnny Wright, Ed Canaday, Allan Tomkins, Terry Phillpot (1998).